Astrophoto: Planetary nebula image combining different telescopes. Power of Multiple Amateur Telescopes, UNITE! Taking pictures of astronomical objects is a lot like collecting rainwater in buckets. Photons from your target are the rain, and your telescope is the bucket. The bigger the bucket, the more rain you collect. You get more water if you leave the bucket out longer, too. So astronomers like to use big telescopes and long exposure times to get faint detail in their cosmic portraits. However, there’s a third option: Use more than one bucket. 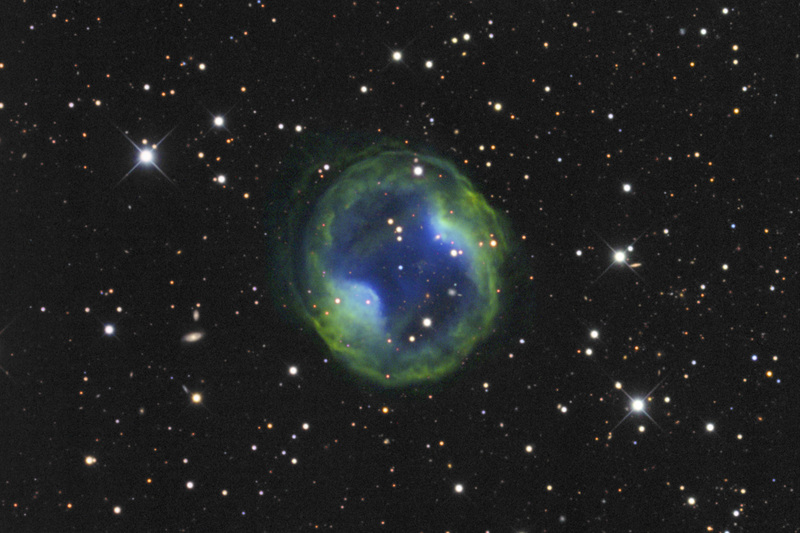 With that in mind, let me show you this fantastic picture of Jones-Emberson 1 (JE1), the gas shed by a dying star. Mind you: This is not a Hubble photo! 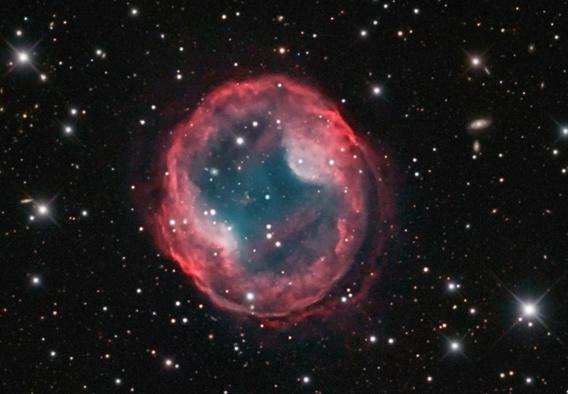 The planetary nebula Jones-Emberson 1, a dying star 1600 light years from Earth. This image was taken using six different small telescopes, with their power combined into one beautiful picture. Photo by Michael Stauning, Michael Rask, Torben Taustrup, Flemming R. Ovesen, Morten la Cour, Paul Christiansen, and Morten Balling. Used by permission. Isn’t that gorgeous? It’s even cooler than you think, too, because it’s actually the combined result from six separate telescopes… not one of which has a mirror bigger than 35 centimeters (14”)! Not only that, but it represents a total exposure time of 125 hours—more than five days. It was created by observations from amateur astronomers Michael Stauning, Michael Rask, Torben Taustrup, Flemming R. Ovesen, Morten la Cour, Paul Christiansen, and Morten Balling. It was Balling who contacted me about it—he and the other astronomers organized their efforts through the Danish bulletin board Astro-Forum.dk. Balling collected the data and combined them into the image above. Incredibly, some of the observations were done not far from the heavily light-polluted city of Copenhagen. However, the use of narrow filters (that is, filters that let through a very small range of colors) cut way back on the amount of light from the city, while still letting the nebular light pass through. The exposure times of individual images ran from 300 – 1800 seconds (5 - 30 minutes). I was not familiar with the object when Balling sent me the image, so I was surprised by it; I’ve studied planetary nebulae and love them, so there aren’t many I haven’t seen before! JE1, it turns out, is a very large and exceedingly faint object, and not as popular a target as some smaller, brighter nebulae. Located about 1600 light years away, JE1 is shaped by the winds from a dying star. I’ve described how this all works in many previous posts (notably for the Cat’s Eye nebula, NGC 7026, and NGC 1514, which has to be seen to be believed). In the image above, red is light from hydrogen, and blue from oxygen. Thousands of years ago, the star in the middle of JE1 started blowing a dense, slow wind that compressed the material around it, forming the outer shell. Eventually, a faster wind started up that then pushed into the slower wind, carving the more evacuated region in the middle. I’ll note that it looks like all the oxygen in the nebula is in the middle, but that’s an illusion. The filter used here (called an [OIII] filter) selects a particular color emitted by oxygen when it’s had two electrons stripped from the atoms. This type of atom strongly emits light, but is also fragile; in too dense an environment the remaining electrons get jostled and the atoms won’t emit this kind of light. That means if you use an [OIII] filter you only see oxygen from the less dense regions—there’s still oxygen all over the place, but it’s not emitting this light. Hydrogen, on the other hand, is everywhere, so if you see less light from it that means there’s less of it around. Also, the odd waist you can see inside the nebula is probably due to the winds being shaped by rotation of the central star as it blew them off. The star was a red giant when that happened, having expanded from a Sun-like star to a bloated ruddy monster a hundred times its original size. When it did so, it may have literally consumed any planets close by. The planets would have sped the star up as they orbited inside it like a chef whipping up eggs, increasing its spin and leaving behind their legacy in the shape of the planetary nebula we see today. I found several other lovely pictures of the nebula online; I quite like this one by J-P Metsävainio (who also created this stunning 3D rotating nebula animation), this one by Bob Franke which uses different colors, and this unusual one created using images from the Sloan Digital Sky Survey. As a last note, I was reading an article by the British Astronomical Association when I saw that this object is nicknamed the Headphone Nebula. I laughed when I read that; it really does look like a pair of headphones. I hope this is the beginning of more collaboration between amateur astronomers. It shows that with cooperation and effort really beautiful images can be made. I also think a lot more science can be done as well; a smaller bucket can be more than made up for by calling your friends, borrowing theirs, and leaving them all out in the photon rain for a bit longer.